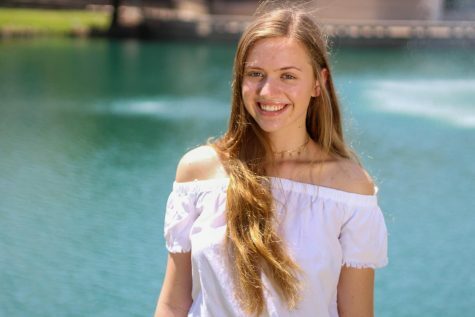 Abby Blasingame is a senior at Plano East and this year’s editor-in-chief of the Panther Prints. Newspaper was one of the highlights of her junior year, and she looks forward to creating a similarly positive experience for new and returning staff members. Over the summer, she had the exciting opportunity to intern at the Dallas Morning News. She hopes the knowledge she gained will help improve the already amazing publication. One of Abby’s favorite things about journalism is its freedom in storytelling across different platforms. She is an avid photographer and is always looking for a way to strengthen stories through visuals. She might also be a little bit obsessed with podcasts. In her free time, Abby enjoys playing guitar, running and listening to her fire music taste. She is also a dedicated Girl Scout who has earned her Gold Award. In college, Abby hopes to pursue a major in marketing or, of course, journalism. She also wants to add that she really loves her golden retriever, Dakota.